I ran ink, acrylic and wax together to form the painting called Gathering. 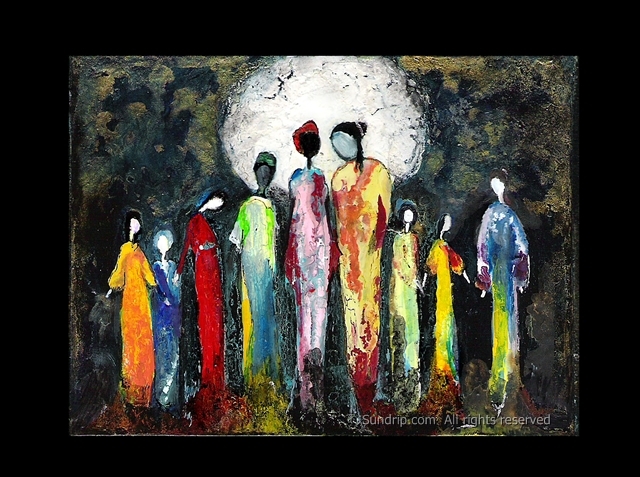 It shows several Asian, African and other ethnic woman standing together with their feet covered in mists of red, green, gold and black. A large white moon glows behind them with its light caught in deep blues and gold. In this emotional and texture rich piece the ladies arms reach gently to connect with one another. 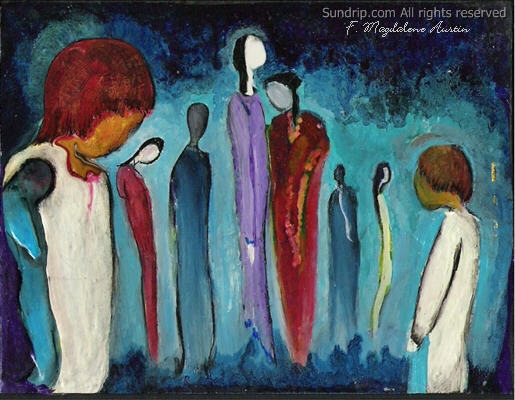 The original of this painting called Women Alone showed several women standing around looking grieved. The purpose of the original version was to show how alienated I can feel when I'm in a lot of pain physically. The rebirth of the painting is to show that despite the pain I'm not alone. The rebirth of this piece was to validate what I felt but also to firmly plant in my mind the reality of the situation. As long as I reach out or make myself available for connection then I am not alone. It is also a reminder that my situation can get ugly and trying but it can change. Life can get ugly and painful but that doesn't mean its the final curtain call. Things can change.